The origin tale of Chun-Li tells her early aspirations of becoming a concert pianist as a child, while also learning the martial art of Wushu from her father. Years after Chun-Li's father is taken by a rival buisnessman Bison and his henchman Balrog, she is given an ancient Chinese scroll. The scroll may be the only answer that will unlock her true talents and be the key to finding her long lost father. "Street Fighter: The Legend of Chun-Li" is an absolute cinematic waste of time and a complete disgrace to the Street Fighter video game. The film is poorly written, with dialogue that feels straight out of a daytime soap opera and character development that does nothing to attract the viewer in any way. The performances throughout the film are dismal at best, with some performances that are miserably laugh out loud funny. Director Andrzej Bartkowiak (Doom) only proves with "Street Fighter: The Legend on Chun-Li" that he is better served only lensing a film as cinematographer rather than taking on the director role, especially when it comes to popular video games! 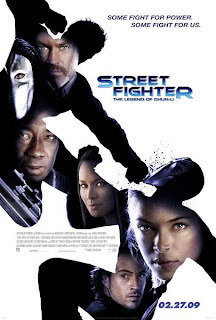 In a film called "Street Fighter," based off a widely popular fighting video game, you would expect some outrageous martial arts and a lot of fighting. However here in "Street Fighter: The Legend of Chun-Li" you get only small bits of fighting and nothing that resonates any resemblence to the video game. To make matters worse, this being an origin tale, we do not see anything of the actual Street Fighter Tournament. The little fighting there is, is shamefully choreographed and is unimpressive at best. Sadly, there are very few signature moves coming from the main characters and even they are valueless when seen in painstakingly boring sequences. The wire work that was utilized throughout "Street Fighter: The Legend of Chun-Li" is dreadfully obvious and the unskilled cast do their worst in making the sequences even harder to watch. One thing director Bartkowiak did include from the game is the "Kikoken" and unfortunately it is so badly animated that when both Gen and Chun-Li use it in the film, the result in nothing you'd hoped for. Casting director Nutjaporn Swasdiprom, should be relieved of his position. Every single character outside of Balrog was terribly miscast. Kristin Kreuk (a canadian) who played Lana Lang in the WB's Smallville is now Chun-Li? Not only was Kreuk unable to carry the film, everytime Kreuk was next to an authentic asian actor it became laughable how much she looked nothing like the video game character or a Chinese American. Neal McDonough as M. Bison? This one is a real stretch as well, and McDonough's lack of physical definition was hardly what you would expect from Bison. McDonough does have the piercing eyes that Bison's character is known for, but outside of that, he was a very poor representation of the merciless leader of Shadaloo. Taboo from the Black Eyed Peas as Vega? Simply, another pathetic attempt to adapt the video game to film. To be fair, Vega did at least dawn the classic mask and claw, unlike Chun-Li, Bison or Balrog who never wore any attire seen in the games. The casting of Robin Shou as Gen was a nice kick in the balls to any Street Fighter fan as well. Shou played Liu Kang in all of the Mortal Kombat films and now here in Street Fighter, he is training Chun-Li. It is extremely ironic that Street Fighter fans have to see their beloved Chun-Li being trained by Liu Kang from Mortal Kombat. No doubt this could only fuel the fire in the bitter dispute between which fighter game is better. Outside of none of the characters resembling their video game counterparts, the performances in "Street Fighter: The Legend of Chun-Li" are downright awful. Most notable is Chris Klein as Detective Charlie Nash. Nash's character has been searching for Bison, the leader of the terrorist organization known as the Shadaloo. Klein delivers what is sure to land him a Razzie nomination for worst supporting actor. Most known for his American Pie role, Chris Klein is dreadfully over-the-top as the sleezy detective trying to track down Bison, leaving me laughing almost every time he was on screen. Equally as bad, is Moon Bloodgood as Detective Maya Sunee. Bloodgood is undoubtably easy on the eyes, however her part and performance do nothing to help terrible film in any way. Michael Clark Duncan, who can be downright funny, is also a disappointment in "Street Fighter: The Legend of Chun-Li." Duncan does look the part of Balrog, but the poorly written script leaves his character with little to do and terrible dialogue to deliver. Overall "Street Fighter: The Legend of Chun-Li" was a terrible adaptation of the popular video game. Director Andrzej Bartkowiak was successful in creating a movie that made the original 1994 Street Fighter film to look like a masterpiece. At the very least, the original was able to give fans of the video game what they wanted. This new origin tale was hard to sit through, had dreadful dialogue, a subpar cast and sloppy action sequences to make for a undesirable movie going experience. I recommend that you skip this film and I wouldn't even watch it again on cable.